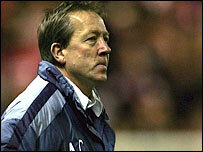 Charlton boss Alan Curbishley is downbeat over his chances of succeeding Sven-Goran Eriksson as England manager. The Football Association is reported to have interviewed the leading candidates for a second time earlier in the week but Curbishley was not among them. He told BBC Five Live after Charlton's FA Cup defeat: "Something should be sorted out in the next couple of weeks. "But I don't know if I'm included in that because I haven't been contacted. I don't know what the situation is." Steve McClaren is now the bookmakers' favourite to succeed Eriksson, who is set to stand down after this summer's World Cup finals. However, the Middlesbrough boss says he is focusing on his job at the Riverside rather than on the ongoing speculation. Bolton boss Sam Allardyce, former Celtic manager Martin O'Neill and Portugal coach Luis Felipe Scolari are thought to be the other candidates. An announcement is expected within three weeks.